Per the Association for Library Services to Children (ALSC), El día de los niños/El día de los libros (Children’s Day/Book Day), known as Día, is an every day celebration of children, families, and reading that culminates every year on April 30th. The celebration emphasizes the importance of advocating literacy for children of all linguistic and cultural backgrounds. Increase the public’s awareness of the Children’s Day/Book Day (Dia) program. Develop materials and programs that can be a model in other states and communities. Make available on the Web easily downloadable materials useful for developing and publicizing the program locally. Expand the number of public and school libraries participating in the CDBD program. Four $250 mini-grants will be awarded to a public or school library to implement a new Dia event or to add to an existing Dia event. The objective of the event must emphasize the importance of advocating literacy for children of all linguistic and cultural backgrounds. 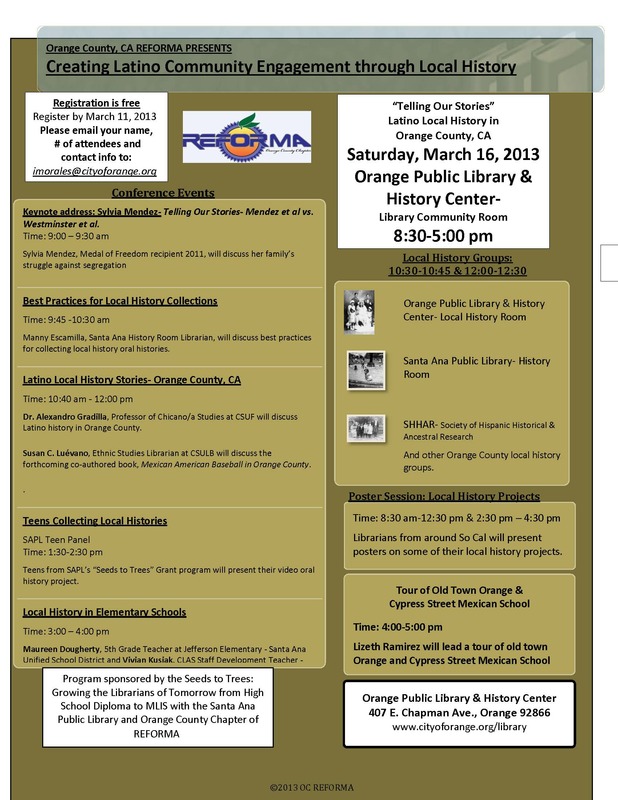 In order to be eligible, public and school libraries must be within the Orange County service area OR have a staff person who is a member of Orange County Chapter of REFORMA. Mini-grant winners must agree that publicity of their event will identify Orange County REFORMA as a sponsor/partial sponsor. Winners must be willing to have their program featured in our website both in written and photographic detail. Applications must be postmarked by April 6, 2013.